Background: Grafting of polyacrylamide and locust bean gum was performed by microwave assisted copolymerization using of cerric ammonium nitrate as the reaction initiator. 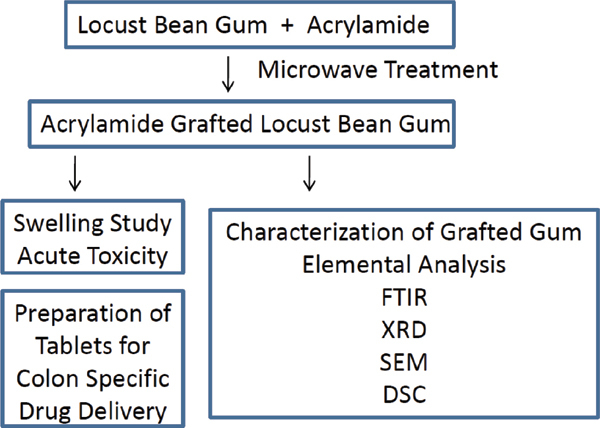 Methods: The grafting process was optimized in terms of concentration of acrylamide, amount of CAN and microwave irradiation time fixed quantity of locust bean gum (LBG). The characterization of grafted gum was performed by XRD, FTIR, SEM, DSC swelling studies, elemental analysis. Results: Small quantity of nitrogen was found in elemental analysis of pure gum (0.942%) however grafted gum depicted a significant amount (15.66%) confirming the acrylamide grafting of LBG. Acute oral toxicity study showed the grafted gum to be non-toxic. Conclusion: Grafted LBG was utilized to prepare colon targeted delayed release tablets of budesonide. The drug release via in vitro procedure revealed that modified gum has probable application in colonic drug delivery system. Colon drug delivery, grafting, locust bean gum (LBG), microwave, polyacrylamide, copolymerization.